My obsession with scones continues. I just can’t think about much of anything else now for breakfast but scones. I have fallen head over heals for them. This is my latest flavor combination, blueberry and lemon. I remember the first time I had a blueberry and lemon dessert at a little lunch spot in Panama City called Sweet Magnolia’s. I haven’t been there in forever, but I still remember the comforting real southern classic food along with delicious sweet treats that were offered in the little dive of a restaurant. But, back to the scones. For these scones I used Yoplait’s® new lactose free yogurt in vanilla. They yogurt made these scones super rich and heavenly. They had the same consistency of a scone made with real cream, but without all the added fat, or lactose. I also used dried blueberries in this recipe because it was what I had on hand, and I like the added flavor they bring, but you could certainly use fresh blueberries instead. Preheat oven to 450°. Combine flour, baking powder, baking soda and salt in a large mixing bowl. Mix well. Add lemon zest and butter. Using a pastry knife or fork, incorporate the butter in the flour until it is grainy. Add egg, milk, yogurt and berries. Mix until just combined. Use hands to finish incorporating flour into the dough. Form a disc with the dough on a lightly floured surface and cut into 8 diamond shapes. 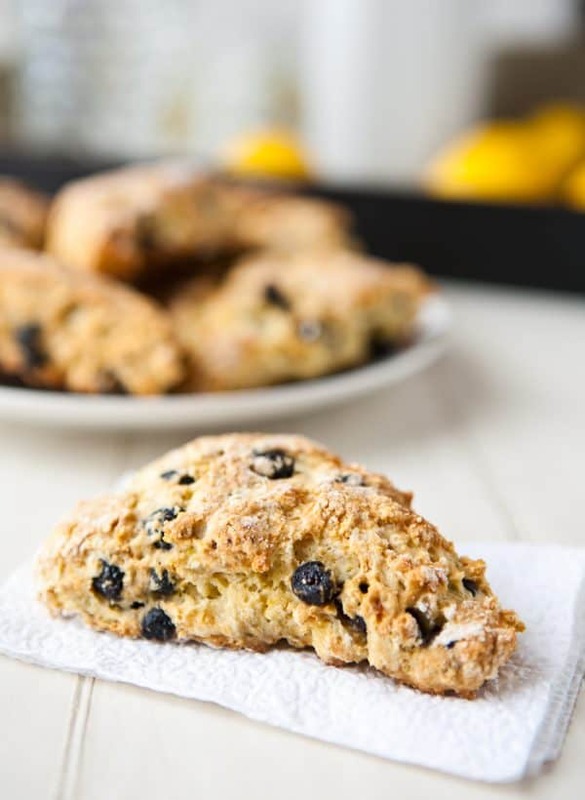 Transfer scones to parchment paper or nonstick surface on a baking sheet. Bake at 450° for 14 - 15 minutes, or until golden brown. Fresh blueberries can be substituted for the dried blueberries in this recipe. 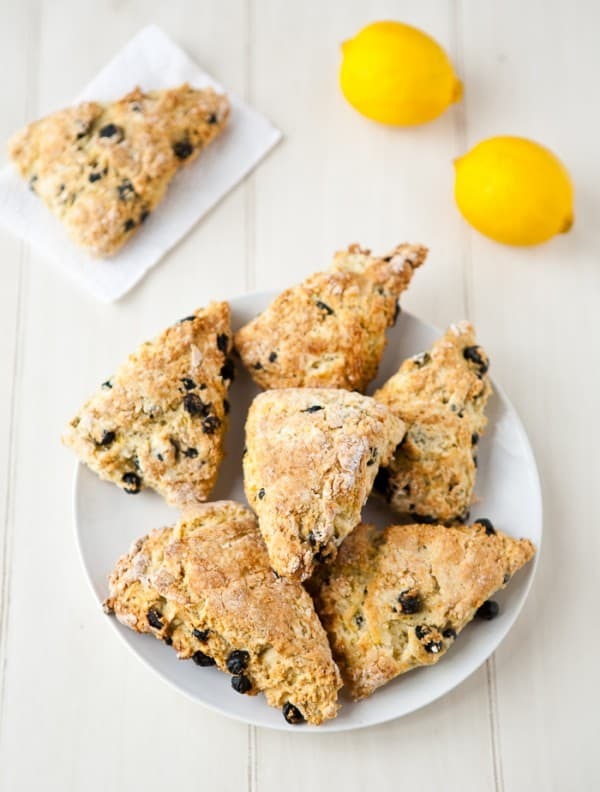 For even more of a sweet treat, drizzle scones with a lemon glaze. To make a simple lemon glaze, combine 1 cup powdered sugar with 2 – 3 tablespoons of lemon juice. Mix glaze well and drizzle over warm scones. This post sponsored by Yoplait®. Yum Angie, I love scones! Scones everywhere today! I love it. The blueberry/lemon combo is always a winner! I absolutely lurve scones and don’t make them often enough. Beautiful as always Angie! I adore scones, especially wonderfully flavorful ones like this! I officially need more scones in my life. 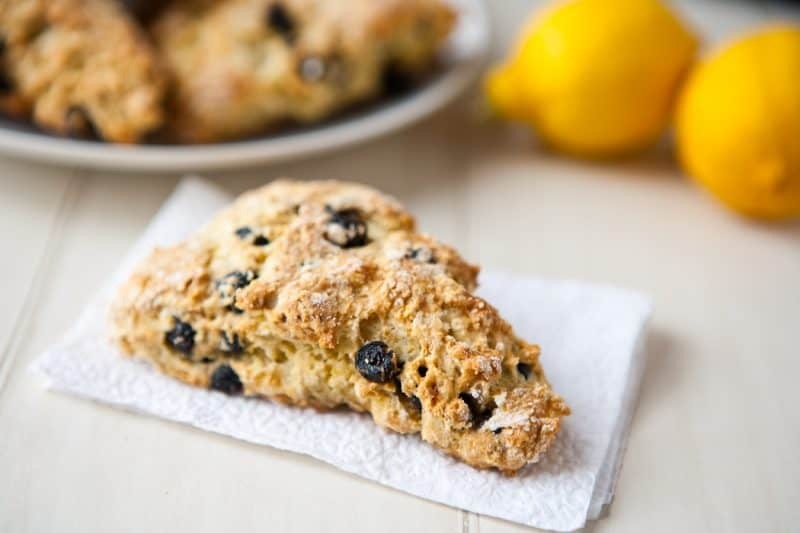 I love lemon scones, I love blueberry scones, but never thought of the two together! these sound delicious – and look great too! I love scones, too, and haven’t made them in quite a long time. I love your combination of blueberry and lemon. Also, appreciate you using yogurt in the recipe. Yum! I am obsessed with scones too & these look great! A simply luscious morning treat and a perfect brunch!